tootsie roll. The child was not injured. candy if their children were in this area. 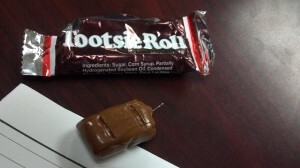 The picture was included in the email but caution is urged with any type of candy and not just tootsie rolls, as candy often comes in mixed bags. Do some research on the topic. It is most likely a hoax. Heck… Google “needle candy” in the News section. Same claim everywhere, yet no one swallows a needle. Hmmm. I took this information directly from the city, who got it from the Chief of Police. Could the parents be hoaxing the city? Sure, but I’d rather be safe than sorry. I don’t know which would piss me off more- the thought of someone maliciiously giving needles to trick or treaters or someone making it all up. Probably the latter. Who’s to say it was malicious? Maybe the needle came from the tootsie roll factory? I don’t see anyt reference to whether the packaging was open or not. Making candy or caramel apples is crazy expensive now anyway. It’s like sewing, it used to be cheaper to sew your own clothes, now it’s significantly more expensive to sew your own clothing. The benefit of it, however, is having clothing that fits like coture. I can’t see any reason for sewing needles to be present in a Tootsie Roll factory, unless the workers were sewing their own clothing on their breaks. Perhaps someone should contact the company that makes Tootsie Rolls, then. I bet they’d be quick to squelch that (for lack of a better pun) needle-in-the-haystack theory. 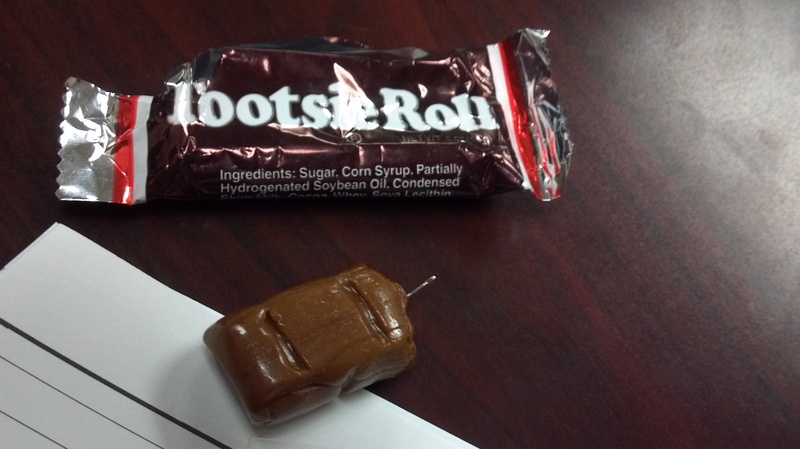 In fact, I bet if this story got some national attention that the person that DID stick a needle in a tootsie roll would be found and prosecuted. If my kid found a sharp object in their candy you can be very sure that I would be knocking on every single door we visited. It was also my understanding that the “poisoning of Halloween candy” was an urban legend to begin with. I’ll have to look up some news archives for some research, I suppose. I hate that Lake Forest is getting bad publicity again. Someone will slip up and say something about this to the wrong (right) person and they will be caught.